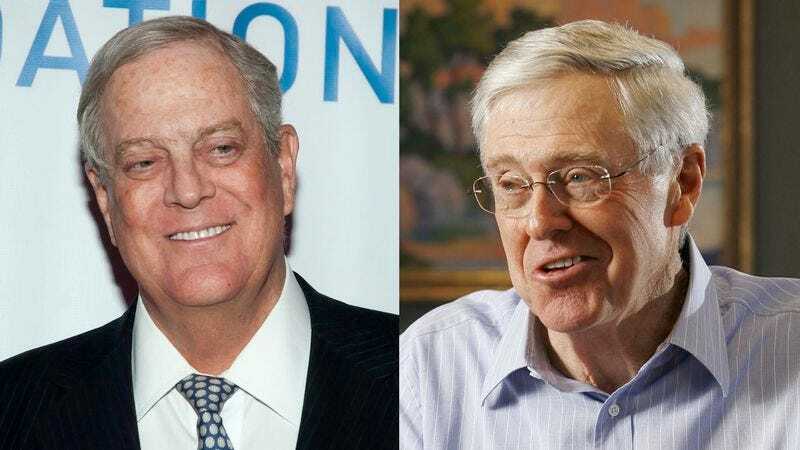 WICHITA, KS—Saying that perspectives of young Americans are rarely represented in today’s political discourse, Koch Industries executives Charles and David Koch released a public statement Thursday encouraging the nation’s youth to make their voices heard in the upcoming midterm elections by establishing an Independent Expenditure-Only Political Action Committee. “Today’s political decisions will have an enormous impact on all young Americans, which is why we hope you’ll participate in the democratic process this election by filling out Federal Election Commission Form 1 identifying yourselves as a 501(c)(4),” said Charles Koch, adding that if the nation’s 18-to-24-year-olds are going to help shape the future of the country, it is vital they begin soliciting millions of dollars in contributions from anonymous donors to be spent on a multilayered media strategy. “We don’t care if you spend your slush fund on attack ads, opposition research, push polling, or anything else—we just want you, the young people of America, to be involved. Managing a mostly unregulated war chest and concealing your strictly prohibited coordination with the candidate of your choice takes very little of your time. So please, don’t sit on the sidelines this November.” The Koch brothers added that they hoped today’s youth would stay politically active after the election by using their wealth to wield unending influence over their representative throughout his or her time in office.